High-density polyethylene tanks have been used successfully by growers and commercial pesticide application businesses for years. 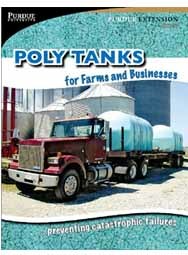 While the benefits of poly tank ownership are well established, the risk of tank failure is real. Like any piece of equipment, poly tanks need to be inspected and maintained to ensure that the benefits of use outweigh the risk of tank failure and product release.